Morning minyan is at 7:30 am during the week, except on some secular holidays (Thanksgiving, Christmas Day, New Year’s Day, Martin Luther King, Jr.’s Birthday, President’s Day, July 4th) when it is held at 9:00 am. Breakfast is provided. On Sunday mornings, minyan is at 9:00 am. Sunday through Thursday nights, the evening minyan is at 8:00 pm, except when the Rabbi Samuel Scolnic Adult Institute is in session, when minyan begins at 8:20 pm. The twice daily, conveniently scheduled minyan is one of the core offerings Beth El provides to members, their families, friends and visitors to the Greater Washington DC area. 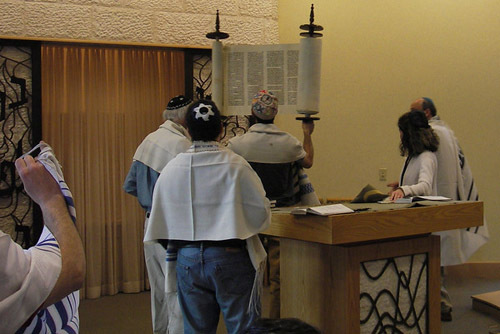 Some congregants attend minyan because they view it as fulfilling a sacred obligation. Others attend because they find it an enriching and peaceful way to start or conclude the day. Many attend primarily when they are reciting Kaddish following the death of a loved one or reciting Yahrzeit, providing them an opportunity to reflect and remember lovingly the life of a person dear to them. provide leadership for the service and a sense of continuity. Those reciting Kaddish or Yahrzeit often form strong bonds that yield new and wonderful relationships that likely would not have occurred but for the minyan experience. The breakfast following the morning minyan helps cement this sense of community. The morning minyan lasts about one-half hour except when reading Torah when it takes an additional ten minutes. We have minyan “captains” for each evening minyan to ensure leadership of the service and help guarantee that we gather the requisite ten people to proceed with the service. When there are meetings in Beth El in the evening, as there are almost every weekday evening other than in the peak of summer, meeting leaders know that they should suspend the meeting if necessary to ensure a minyan. The evening minyan lasts about twenty minutes. One of Beth El’s clergy generally will read Torah on Mondays and Thursdays. Each Tuesday morning, there is a Talmud study class immediately following minyan and breakfast. The daily minyanim take place in the Swoff Chapel.